We offer highly efficientÂ Hot Water GeneratorÂ in the market. Our Gas Fired Hot Water Generator is manufactured from the high grade raw materials to ensure better performance. Oil Hot Water Generator provided by us is in huge demand in the market for performance, strong structure and low maintenance cost. Our heavy duty Gas Fired Hot Water Generator is widely used for bathing and kitchen purposes. We have firmly positioned ourselves as one of the ruptured Gas Fired Hot Water Generator Exporters from India. The hot water generator is a fully automatic concentric helical coil type. Oil/Gas fired three pass (or) two pass forced draught, compact liquid phase heater. HWG will produce hot water. HWG capacity: Upto 10, 00,000 kcal/hr. 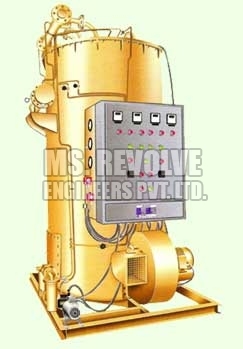 Boiler capacity: Upto 600 kg/hr. Max out let tem. 130-225 degree centigrade in HWG. Application : Bathing and kitchen purpose.